Borderlinx | Buy Mothercare and ship worldwide with Borderlinx. Cheap rates guaranteed. Are you getting ready to become a mother for the first time? Or do you already know what it's all about? Either way Mothercare UK is the place to go for all your maternity needs. Having initially developed as a retailer for mother and baby, Mothercare UK now offers goods for children up to eight years old, and with more than 50 years experience, it's become one of the most trusted companies in UK retail. Mothercare UK's maternity range has everything an expecting mom could want, from maternity clothing to essential accessories. If there's a baby on the way Mothercare UK is the place to go. Mothercare UK's vast experience has enabled it to build up a wide range of different products for mother and baby. Check out the Mothercare UK collections for examples of the cutest outfits for babies and toddlers. And of course, it's not just about clothing, Mothercare UK also offers the very best in strollers, car seats and everything else you need to transport the little one around. And if you're looking for a gift for friends or family, the Mothercare UK gift range has just what you need for the perfect present at a wide range of different prices. 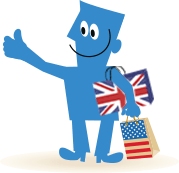 Head to Mothercare UK and then ship your goods to your home country at a cheap cost with Borderlinx, and pay for international shipping, tax & duties before we deliver. You'll be able to work out tax & duty costs upfront with our clever Shipping cost calculator, while our other services at Borderlinx include concierge, free repacking and consolidation services.